From 5 to 7 October 2018, the San Prudencio Foundation trophy will be held. 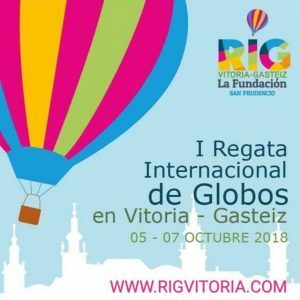 The sky of Vitoria-Gasteiz will be colored with the 1st International Vitoria-Gasteiz Hot Air Balloon Race, which will be held between October 5 and 7, 2018 in the city. The San Prudencio Foundation is the organizer of the race and hence the name of the trophy. Three days of competition for those who like to fly and also for those who enjoy the views from the ground. A good opportunity to discover Vitoria-Gasteiz, all its medieval charm, its natural areas and its enogastronomy. Check here the tourist proposals to visit the city. Here you can consult the program, which may be modified, but initially the competition flights will take place in the Salburua Park of the city. Why Vitoria-Gasteiz and this predilection for balloons? Since the second half of the nineteenth century balloons could already be seen in the sky of the city, linked at first to circus shows. Its privileged geographical location, on the Paris-Madrid route, and the Salburua aerodrome with a remarkable location for navigation, made Vitoria-Gasteiz a relevant enclave in the ballooning, together with Heraclio Alfaro. Grandson of the founder of the house of cards Heraclio Fournier, he was an important aeronautical engineer and aviator from Vitoria-Gasteiz who, since the beginning of aviation, managed to find a place among the pioneers of the sector. From a very young age, he was struck by both airplanes and balloon festivals, balloons and airships themselves. In 1914 he flew his own ship named Alfaro I, the first aircraft built in Spain.